This blogpost is from Clare Reddington, Director, iShed (Bristol)and REACT Executive Producer. 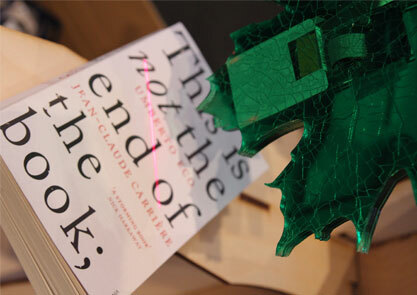 REACT present a day of exploration into the future of book and print on Thursday 5th December. Tickets are only £3 for a Writing for Digital workshop and a panel examining in the opportunities that new technology brings to writing and publishing. The continuing rise of cheap e-readers and tablets coupled with the prevalence of mobile and wifi networks means it is now easier than ever before to download and read whatever book you would like, whenever you would like to read it. This creates fantastic potential, but as yet the publishing industry hasn’t moved much further than simply aping the paper book in digital form. Excited by the untapped creative and commercial opportunity of this area, in January 2013 REACT launched Books & Print Sandbox to invest in new collaborations exploring the digital future of books & print publishing. Over a three month period eight partnerships of academics and creative businesses (and artists, choreographers, technologists, gamers, writers…) developed new product ideas to push at the edges of the possible and gather experience, insight and evidence in search of new commercial potential. From the Secret Lives of Books, a beautiful interactive platform that visualizes the unexploited data of public libraries and bookshops, to ‘these pages fall like ash’, a digital-physical hybrid created where readers explore a city to discover (and write) the story, narrative remained very much at the projects’ heart, blending form and function to create entirely new types of book experience. With opportunities to try stuff out, participate in a Books & Print workshop and hear about the projects, the event at The Library of Birmingham in December gives us a welcome opportunity to drop back in with the teams, eight months after the official end of their R&D period. Now in the process of taking their products to audiences, readers and customers, the project teams will tell their stories, reflect on the results and share insight with others seeking to create future book projects of their own. The panel will be made up of Clare Reddington, Director of the Pervasive Media Studio in Bristol, with Dave Addey, Managing Director of leading app development studio Agant; Tom Abba, lecturer in narrative theory at UWE, Bristol and member of artist collective Circumstance; Charlotte Quickenden, Managing Director of digital agency Bow Software; Laura Kriefman, Founder and Choreographer with innovative dance company Guerilla Dance Project. Ticket holders for the Bill Drummond keynote event can access this afternoon event for free, please contact admin@capsule.org.uk with VOLUME in the subject line for more details.